When the storm broke this morning, it left Mt. 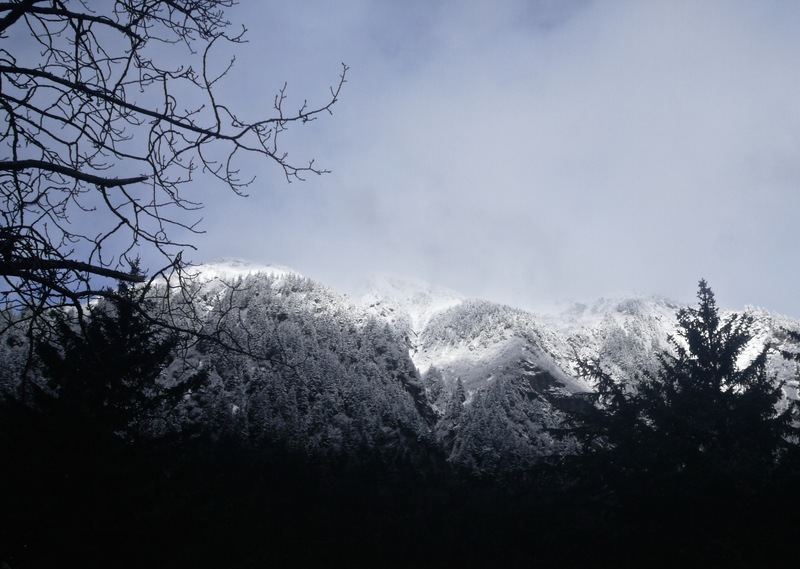 Juneau covered in six inches of new snow. While Chicken Ridge’s streets glistens under gray light, sun seemed to explode off Mt. 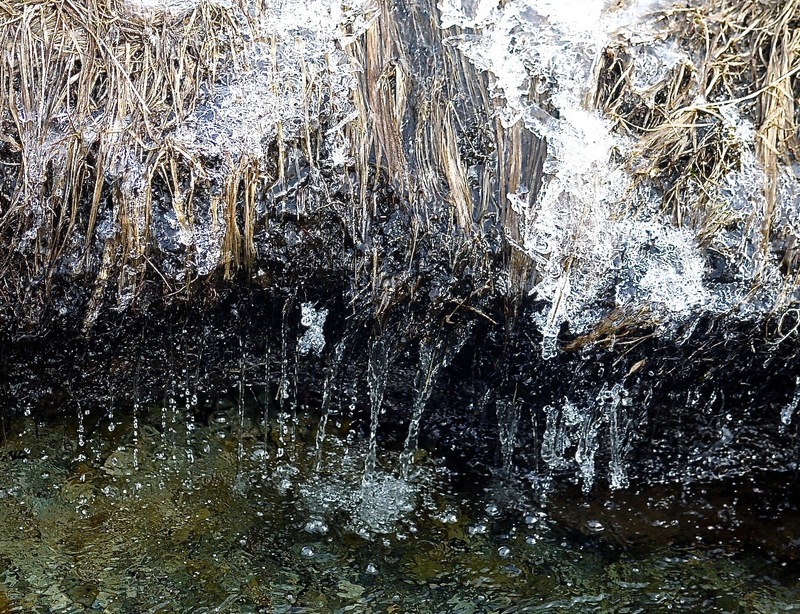 Juneau’s new snow pack. 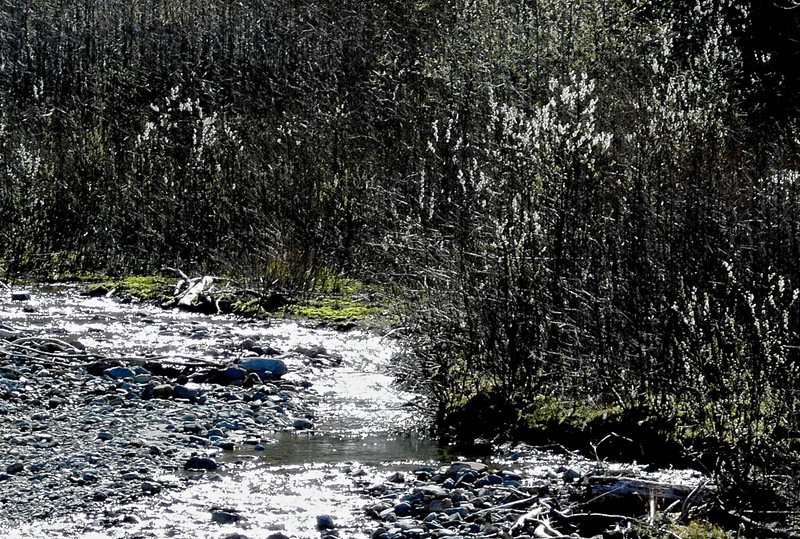 I pack the little dog into the car and drive up Douglas Island’s Fish Creek Road. We passed the parked pickup trucks of hunters who hope to shoot one of the deer driven out of the mountains by the new snow. Unlike the deer, Aki loves snow. 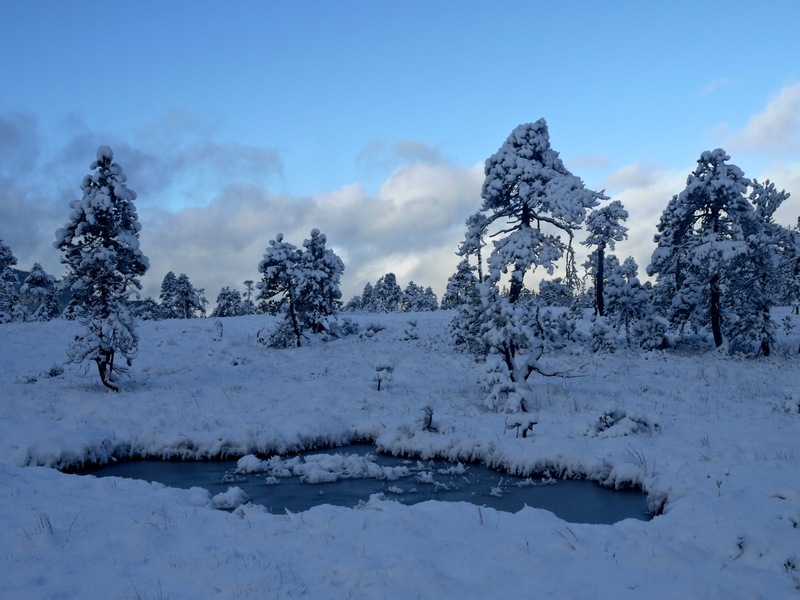 She shoots out of the car and onto a newly white meadow. Finding it too deep for walking, she moves across the meadow with a series of leaps. I walk behind her, surprised that my stride roughly equals the distance covered by one of the little dog’s jumps. 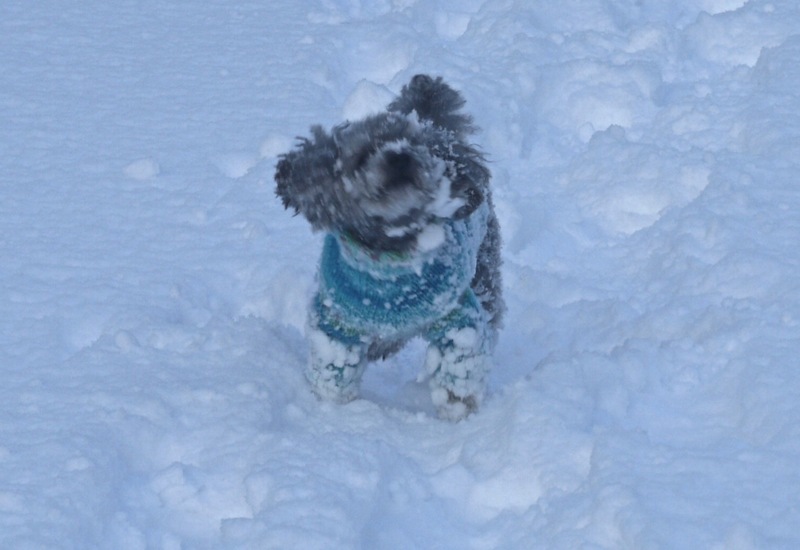 The new snow clumps up on her hair so she stops often to chew snowballs off her legs. 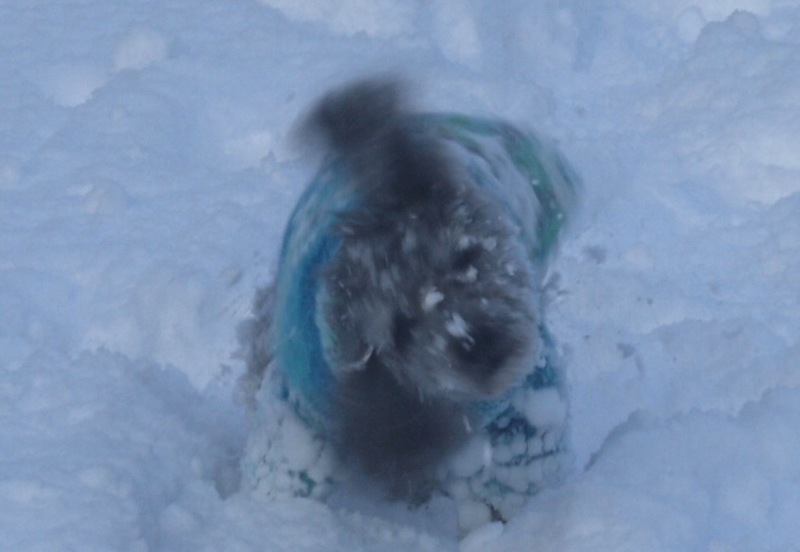 Once she plunges her face into the snow cover and clears her face of it by twisting her head back and forth. I can almost hear her ears snap. 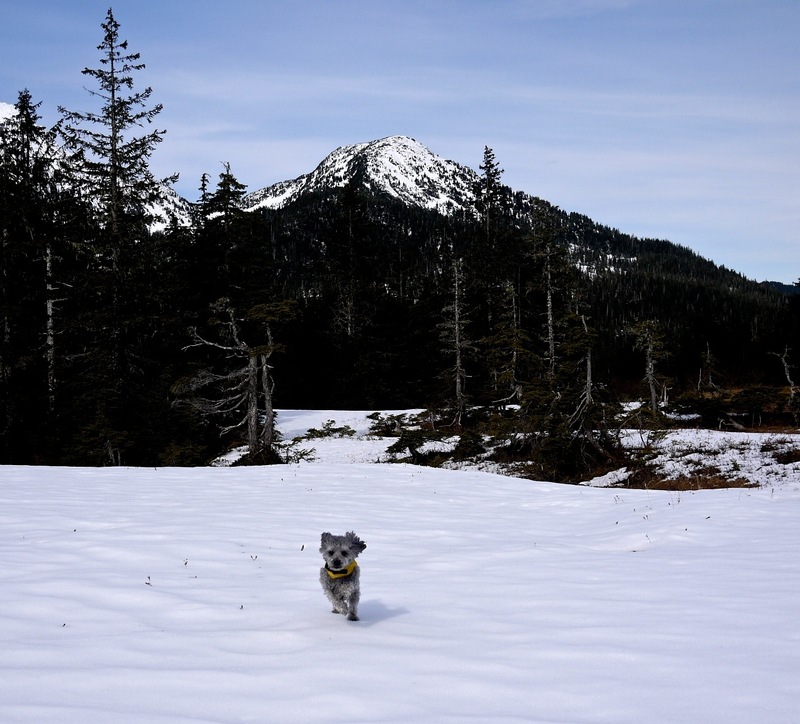 This entry was posted in Uncategorized and tagged Dan Branch, Juneau, nature, poodle on November 11, 2015 by Dan Branch. 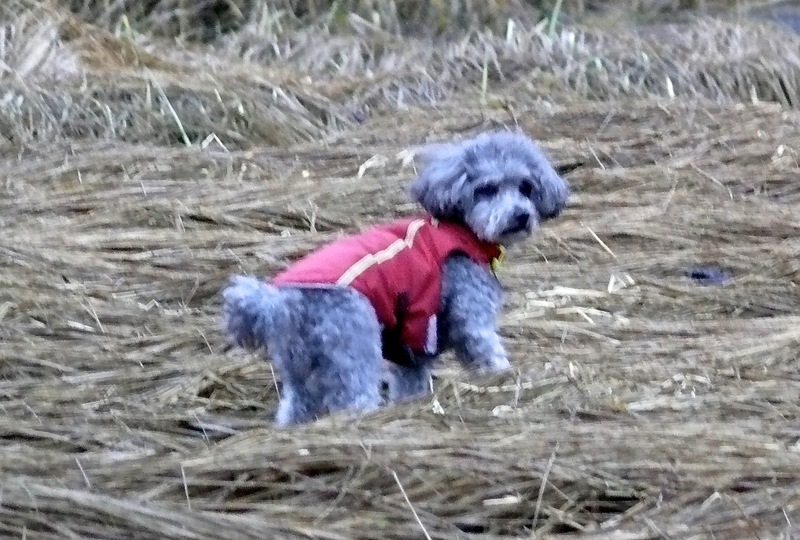 I brought Aki to Treadwell for a sheltered walk among the old gold town ruins. The steady storm has already overwhelmed the bare-boned cottonwood canopy so we walk on mud, instead of the expected gravel trail. I look through thick walls of rain for a metaphor or simile that might be expanded into a poem. But none of the cast iron relics, made by true craftsmen over 100 years ago, stir my imagination. A boiler held together with thick bolts has no connection with my computerize life. An ore car rail emerging from the flesh of a spruce tree doesn’t drag me down a rabbit hole to find a mirror image in my life. We leave the woods for the beach near the deep little bay formed when mine tunnels that ran under the channel collapsed. You would think that the worn pilings that once sported a shipping dock would make a good metaphor. I try some out out: rotten teeth, Hayden’s Wall, ghost army, the gates of Hell. All bad. and makes them smell like spring. 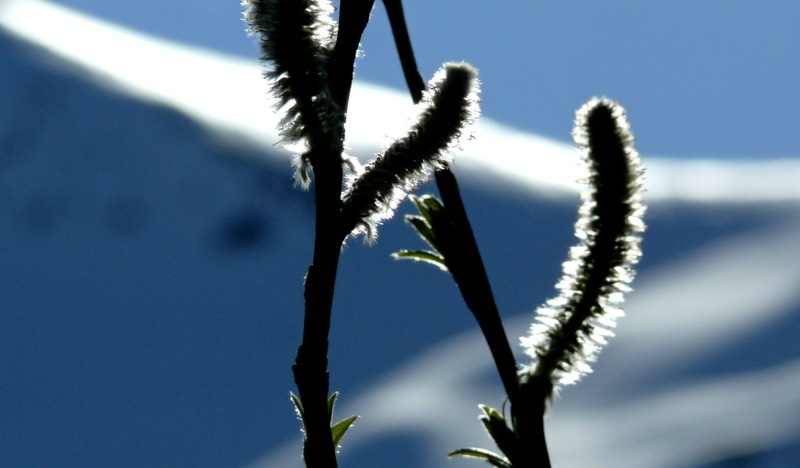 This entry was posted in Aki, Dan Branch, Juneau, Nature and tagged Dan Branch, Juneau, nature, poetry, poodle, Southeast Alaska on April 20, 2015 by Dan Branch. 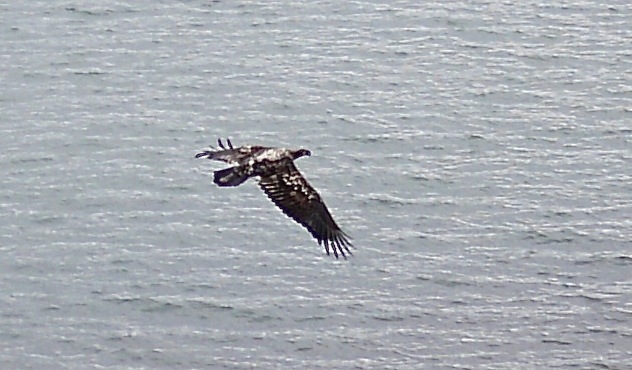 I find an old friend on the Outer Point Beach. 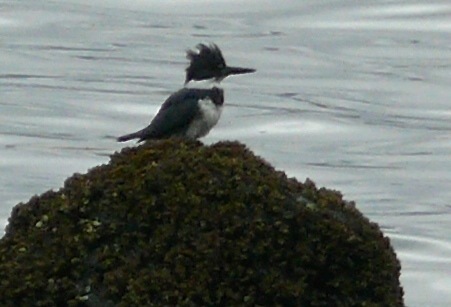 A belted kingfisher watches from a perch on offshore rock as Aki and I emerge from the old growth. Aki and the bird ignore each other. He might be ignoring me as I walk slowly toward him to get a better photograph. I love this bird with its spear of a bill and mullet topknot. I like his feisty verbal challenges and goofy way he flies: up with a frantic beat of wings like a hummingbird then down in a dipping glide. 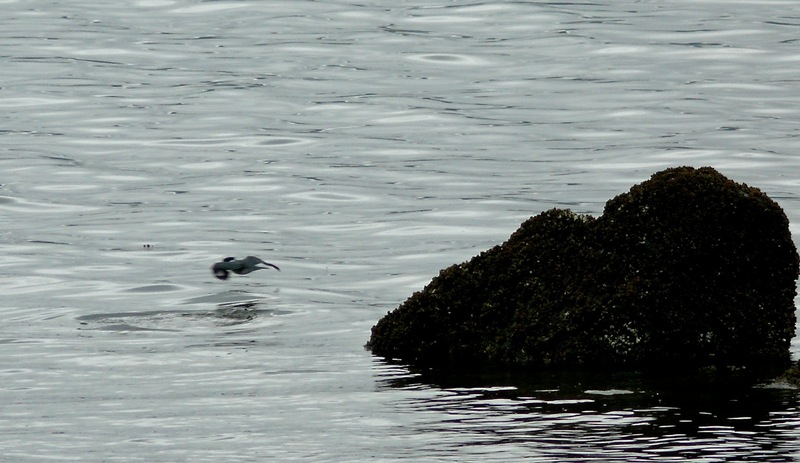 Twenty years ago on Prince of Wales Island a cloud of kingfishers circled my kayak and dived on a school of baitfish. The birds tucked in their wings and penetrated to a surprisingly deep depth, their passage marked by a line of bubbles in the water. I felt fear, wonder, and privileged to witness their casual demonstration of skill. I wanted to share it. I wanted to enhance the experiences value through secrecy. I never saw such a thing again. 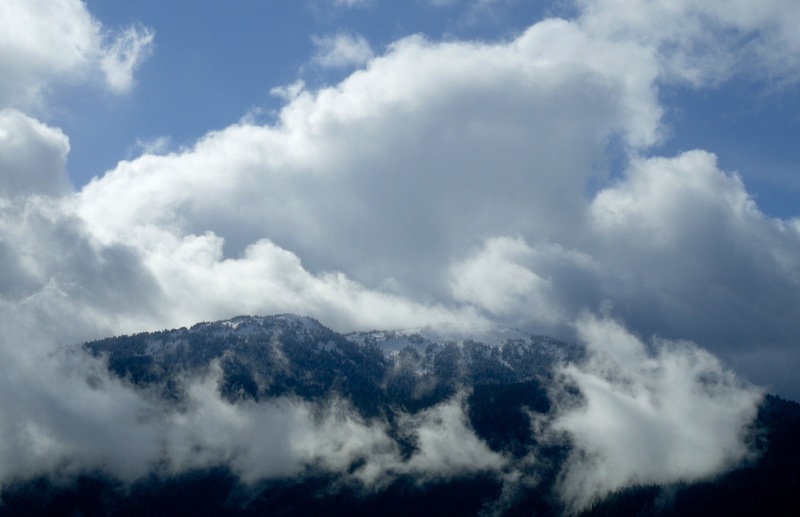 This entry was posted in Uncategorized and tagged Dan Branch, Juneau, Kwethluk, nature, poodle, Southeast Alaska on April 19, 2015 by Dan Branch. Bilbo is the first good thing that has come our way on this adventure. 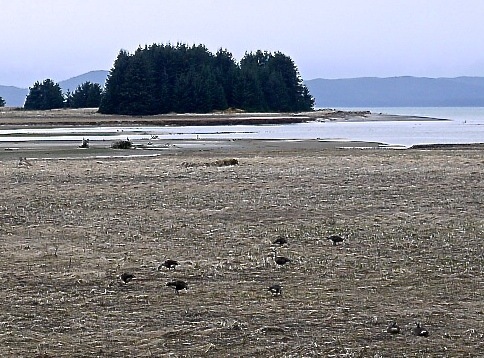 Before the big Chesapeake Bay retriever joined forces with Aki, it was all rain and emptiness along Eagle Beach. That’s a bit of an exaggeration. 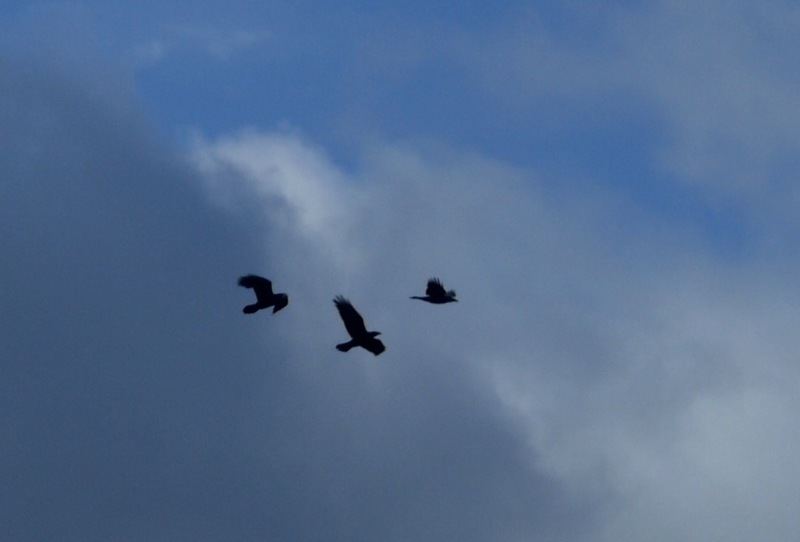 There were the crows, a small murder (manslaughter?) 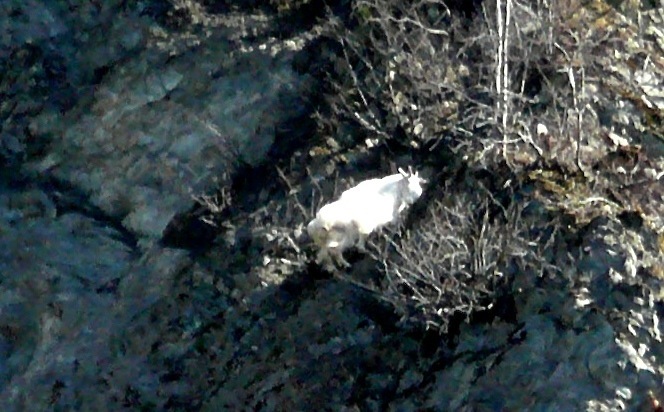 that croaked at us from safe perches along a narrow trail. We heard the nervous Canada geese that still fly almost of eyeshot along the river surface. I wonder if Bilbo makes them tense but the geese don’t react when he lumbers toward then and into the river, as if he needs to cool off on this 40-degree day, as if there is not enough rain to keep his skin pliable. When they first met, the Chessie wiggled and galumphed around Aki. After he settled down they formed a dog gang—Aki the brains and Bilbo the muscle. Every few minutes Bilbo wets himself in the river. Aki stays in the meadow always on alert for smells and animal movement to investigate. When they reunite, Aki appears to organize them into a recon patrol. 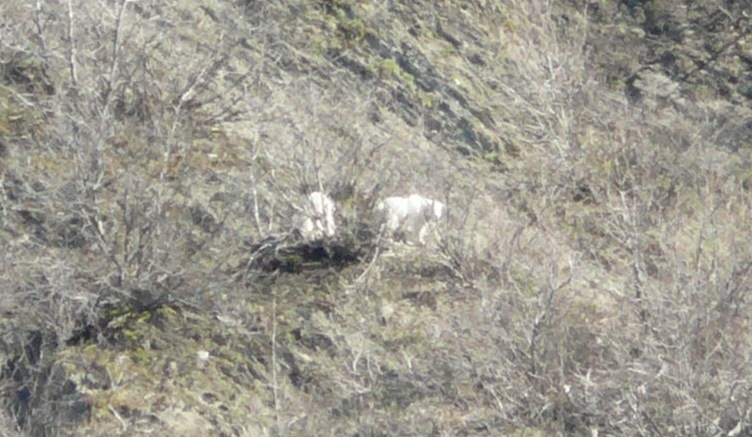 Just before we reach the woods, I hear a faint, “Bilbo.” Way down meadow a mom and her two kids call for their dog. Bilbo ignores the summons like he ignores the queen bumblebee that circles his thick skulled head. I pick up Aki to break the spell. Without the little poodle mix to distract him Bilbo hears his mistress and lumbers back to her. I drop Aki to the ground; half expecting her to follow her new homeboy, but never gives him another look. A minute later we stumble on a local naturalist sitting in front of a blue berry bush covered in blossoms. Even though we interrupted his attempt to film a feeding bubble bee, he is gracious and tells me that only queen bumblebees survive the winter. All her royal subjects perish in the cold. These insects cannot be capable of emotion. No one with feeling could ever survive such generation genocide. 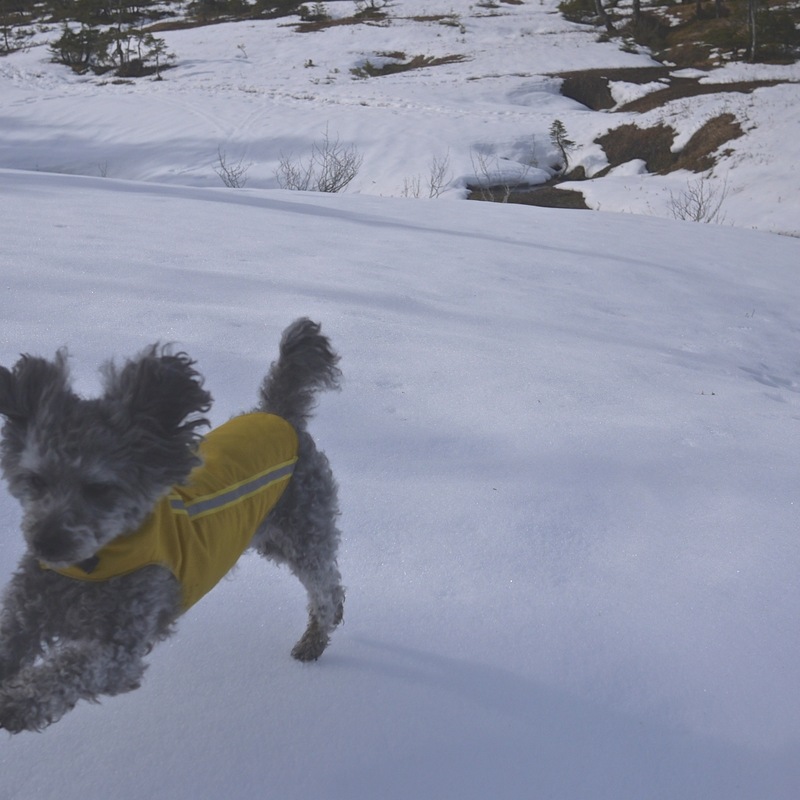 This entry was posted in Aki, Dan Branch, Juneau, Nature and tagged Dan Branch, Juneau, poetry, poodle on April 18, 2015 by Dan Branch. Is the Devil Beating His Wife? You might say the devil is beating his wife this morning if your devil, when angry, grows yellow like the sun and his beaten wife can shed enough tears to soak little Aki and wash the trail clean. I prefer the idea that Akria Kurosawa illustrated in his movie, Dreams: that rain and sun share the skies over fox weddings. 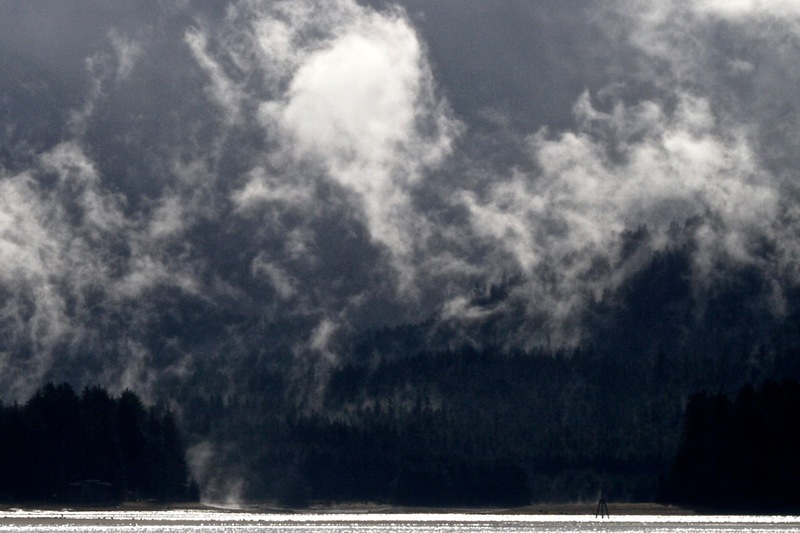 As my Aki, the little poodle mix, and I trot along the lower Mendenhall River, I root for the sun to muscle aside the rain clouds that have been camped out over Juneau for more than a week. The tide is on the flood and in minutes it will cut off our retreat from the riverside beach if we don’t turn back. It has already eliminated the last mud bar in the wetlands and forced an armada of ravens to fly over us to roost in tall spruce. Now they mutter curses at the tide, each other, and maybe us. If they cast criticism of the little dog’s fleece wrap, she ignores it. 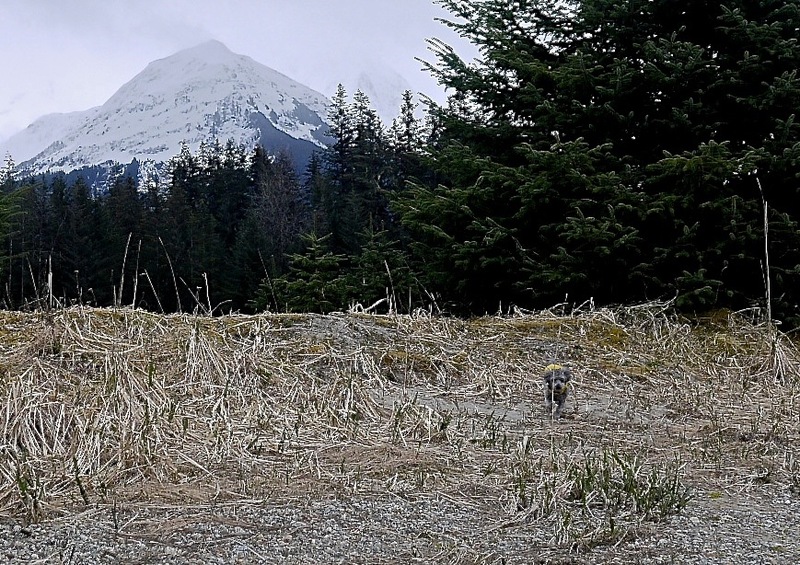 This entry was posted in Uncategorized and tagged Dan Branch, Juneau, Kwethluk, nature, poodle, Southeast Alaska on April 17, 2015 by Dan Branch.